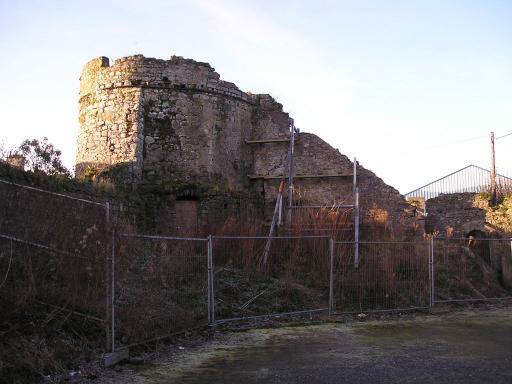 Talbot's Bastion  an uncelebrated, unmarked monument  is one of the few remaining sectors of Kilkenny's medieval city wall, and the only remaining corner tower. The inside of this tower is no longer accessible, and when it was (in the memory of folks I've asked,) was primarily used as a place to go smoke a cigarette when you were too young to do so without permission. The word is that its roof is covered by a layer of soil grown over with grass, in a gentle dome shape. Several writers throughout history have claimed that a man named Robert Talbot supervised the construction of the city wall, and they date him to around 1400. However, neither the identity nor existence of such a man can be determined. The entirety of the wall, around the three edges of the city not bordered by the river Nore, took about a century to build. Its construction was hardly supervised by any one man, and was certainly not instigated in 1400. Robert Talbot? Most Kilkenny people don't even know about Talbot's Bastion, never mind what it's called. So forget Robert Talbot  if he existed.  Talbot's Bastion is on the corner of Ormond Road and Lower New Street, west of the castle, and within the grounds of the Ormond College.